As a style of manicure that is simple yet elegant, the French manicure features white tips that are accentuated by a natural looking base. Popularized by high fashion and popular celebrities during the last century, it continues to play a role in fashion trends today. While no one is exactly sure when or where the French manicure was first introduced, there can be no doubt that by the 19th century, the technique was popular in a number of French nail salons. The style caught the attention of American fashion designers in the early 20th century, leading to its extensive use among the popular actresses of the 1920s. From there, women all over the United States emulated the technique. The trend continued well into the 1930s, with many women making the French manicure part of their standard treatment at the local nail salon Owing to the economic Depression that gripped most of the nation, resourceful women began to learn the steps to create the look of the manicure at home. While a relatively easy process, French manicures tend to be among the most expensive of salons options. Typically, a stencil is used to create the clear delineation between the natural portion of the nail, and the section that is brushed with a white nail varnish. In some cases, the line is created freehand, with nail polish remover used later in the process to take care of any imperfections. Today, there are a number of home manicure kits that allow women to customize the technique to fit their own needs. Handy stencils are included in the kits, along with a range of shades of neutral and white polish and sealer. Several variations of the French manicure are offered today. Instead of a neutral tone for the bottom section of the nail, one approach is to use a pale pink layer to accentuate the white tips. In other instances, various shades ranging from ecru to tan are paired with the tips. The American version features the application of beige tips coupled with a solid pink base. Just as there are French manicures, there are also pedicure treatments that employ similar methods. This means that it is possible to couple matching pedicures with the manicures, making a well-polished look for wear with open toed footwear. We at Shumaila’s provide you with the best and expert professionals to perform this amazing manicure service. 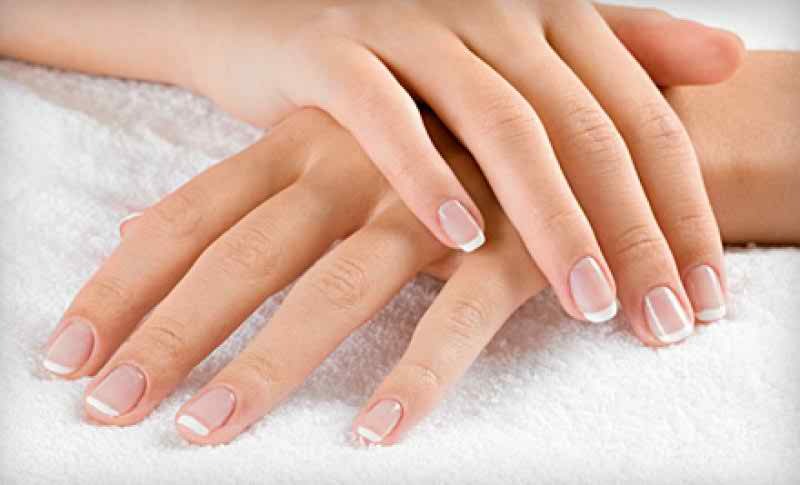 Neutral translucent colored nails with white tips punctuate this treatment. You will have the option of selecting from the available shapes for the nail which may be square, round or oval. Special utensils are used for a neat and quick application of white nail polish on the tips. The manicure keeps your hands and arms clean and in a good condition. It prevents long nail formation and the production of wrinkles on the skin.